24th Jan 2012 Our College joints hands with "Pillar of corruption killer " team and conducted awareness programme on corruption . Mr Vijayananad, Co Founder and president of fifth pillar was accompanied by Mr.R.Jeganathan RTI Trainer ,and coordinators Mr Naresh kumar & Mr Ramachandran. On 10th Feb 2012, Personality Development Programme was conducted for students to know about the interview techniques and to face interviews during placement which is the regular activity of the college. On 20th Feb 2012 , our former president Dr.A.P.J.Abdul kalam visited Dr.N.G.P Educational institutions .the students were taken to Paavai Arangam of Dr.N.G.P Arts and Science College , where the students were given chance to interact with him. 16th & 17th Mar 2012 Two days National Level Seminar conducted in our college on "Best Practices in Enhancing the Quality of Higher Education". Tamilnadu Teachers Education University (TTEU) Conducted 3rd Zonal level Athletic meet in our campus on 31st Mar 2012. Around 32 B.Ed Colleges from various Districts participated in the zonal meet. College Day and Sports Day was celebrated on 2nd May 2012. Function was inaugurated by our Chairman Dr.Nalla.G.Palaniswami and Mr.A.M.Palaniswami, Chairman, Aerospace was the chief guest. 7th May to 29th May 2012 our college conducted 12 Days workshop for TNOU Students & SASTRA Students on effective teaching and learning. On 8th Aug 2012, Research Cell Activities are inaugurated by Dr. Lee Chew Tin, Assistant Professor, Regional Manager (North Europe): University of Technology, Malaysia. The Inauguration of VIII Batch of B.Ed Students took place on 23.08.2012. Our Principal Dr.V.Ramakrishnan gave the Welcome address to the budding teachers by highlighting the administration setup of our college. On 04.09.2012, as a part of Research Cell Activities, Dr. G.Uma , Prof of Statistics , P.S.G. College of Arts and Science, Coimbatore delivered a lecture on "Research and Statistics". On Behalf Of Red cross, a one day camp on awareness programme on health and personal hygiene to people was conducted by our students on 8th Sep 2012. On 10th Sep 2012 , on behalf of Research cell Activity, Dr.NakkIren, Prof of CO-Operation, AMBO University Ethiopia gave a lecture on the topic "RESEARCH". On 11.09.2012, the inauguration of Science club activities was conducted in our campus. Dr. R. Kumaresan, Prof. and HOD, Department of Physics, Government Arts College stressed the activities like exhibition, preparation of models etc to be conducted in "Dr.AP.J Abdul Kalam Resource center " of our college. On 12th September 2012, an collaboration with Dr.N.G.P. Institute of Technology was made to give students more exposure on Computer Based Education – Hands on Training on "Moodle Training". Dr.S.Mohan, Prof and Head – CSE, Dr.N.G.P. IT was the Resourse Programmer. On 12th Sep 2012, Dr.K. Durai Raj ,Vice Principal of Dr.N.G.P College Of Arts and science, gave a lecture on life oriented skill under the topic " Empowerment" to our students. On 13th Sep 2012 , Dr.S.Madhavi, Principal, KMCH College of Nursing gave a lecture on "Stress Coping Management" as a part of Life oriented skill. Mrs.B.Uma shankari, HOD, Department of Hospital Management gave a lecture on Life Oriented Skill under the topic " Self Awareness and Self Motivation" on 14.09.2012. On 14.09.2012, Dr.Sri .Priya, Director, Department of Management studies gave a lecture on Life oriented skill under the topic "Transactional Analysis". On 17.09.2012, Mrs.Saritha, HOD, Department of ENGLISH, Dr.N.G.P. Arts and Science College delivered a lecture on "Communication Skills Development". 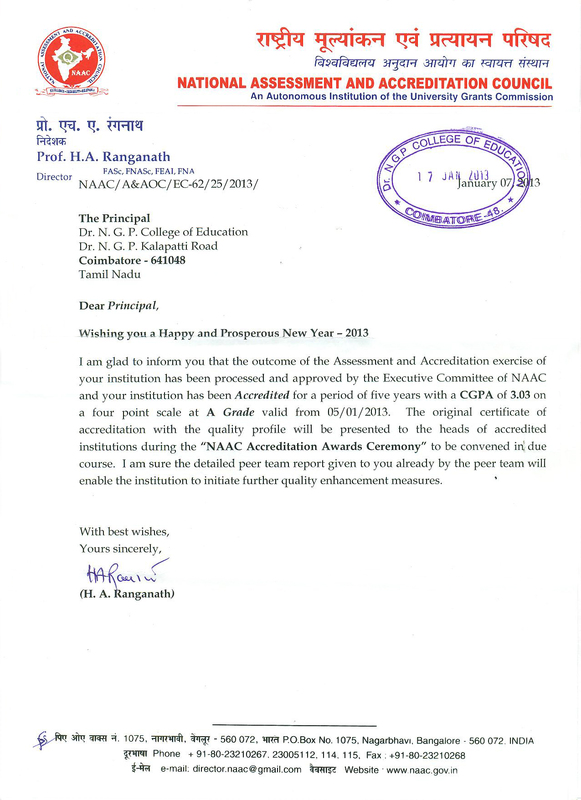 Dr.P.R.Muthusamy, Principal, Dr.N.G.P. Arts and Science College also delivered a lecture on "Time Management" on 18.09.2012. The importance of scheduling the work, intensity and usefulness of the task, time based schedule etc was highlighted as the parameters for the time management.